I like to take a real, good, close-up look. As a child, I examined the fleas pulled from my dogs. I hunted through their fur for the fleas that were fat with blood and placed them under my childs microscope. This unseen world was exciting and transformative. The use of a microscope can shift your perspective, revealing complexity in that which is small, diversity in that which you thought the same and biological commonality amongst living things. Armed with a light microscope and a dissecting microscope I planned to share this world with the students of the future science leaders program at Science World. I was so excited about these lessons that every time I played them out in my mind the lessons started looking more like a von Trapp family outing to the lab! We examined our own cheek cells, we made slides from the pollen of a bouquet of flowers. At the culmination of the lessons about making microscopy slides and the basics of how to use a microscope I challenged the students to produce one 8X10 image taken on our microscope of the subject of their choosing. If we weren’t going to be the von Trapps we would be Warhols. 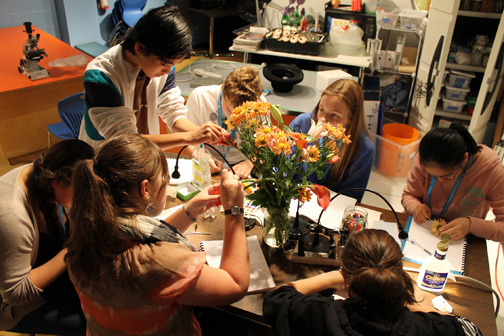 Students picking pollen from a bouquet to examine under the microscope. 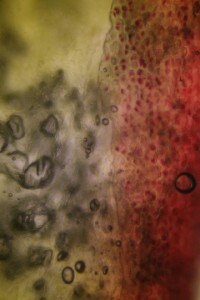 Apple Cross Section at 400X magnification. This was a chance for students to demonstrate their new microscopy skills in a way that could be displayed proudly. [ed note: each student got to choose one image to be displayed on the wall.] Every time I look at the 8X10 displayed on the wall, it reminds me to be deeply curious of all things around me, to be open to surprises and to remember that even though lessons don’t end in spontaneous song and dance they can still have lasting effects on both the teacher and the pupil. Excellent! Well written, funny and interesting, as well as informative – don’t often find all together!